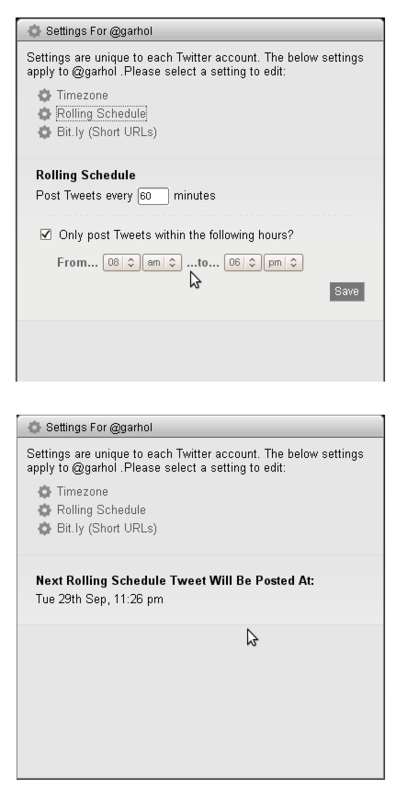 Minor bug report: After adding a rolling RSS item, I set the timezone and then allowed tweeting hours to 8am - 6pm. The RSS item was added to the rolling schedule at 10.26pm and on the settings panel showed 11:26 pm as the next tweet time. Would be handy if it also caught the rolling schedule restrictions on hours as I was unsure that it had noted my preference. I would have expected the next tweet time to be listed as 8.26am the following day. Good point. Thanks for this! I'll put it on the stack!